Americana inspired restaurant, Ed’s Diner, has created the ultimate ‘Love Shake’ combo meal to get pulses racing this Valentine’s Day. The bundle, available in all restaurants nationwide and via Deliveroo, includes a limited-edition Love Shake laced with renowned aphrodisiacs, spicy hot chilli and rich dark chocolate – as well as one of Ed’s juicy burgers and a side of fries. 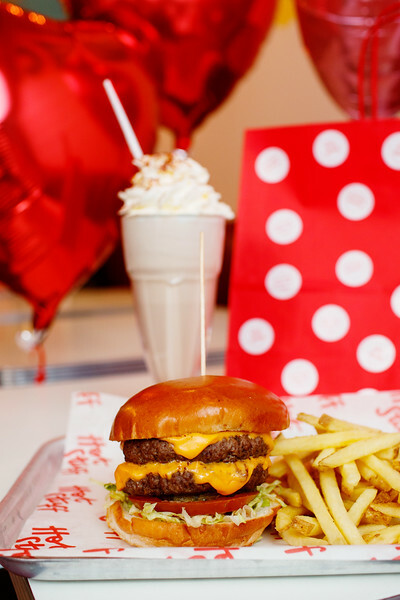 FREE FOR EDITORIAL USE - Americana inspired restaurant, Ed’s Diner, has created the ultimate ‘Love Shake’ combo meal to get pulses racing this Valentine’s Day. The bundle, available in all restaurants nationwide and via Deliveroo, includes a limited-edition Love Shake laced with renowned aphrodisiacs, spicy hot chilli and rich dark chocolate – as well as one of Ed’s juicy burgers and a side of fries.